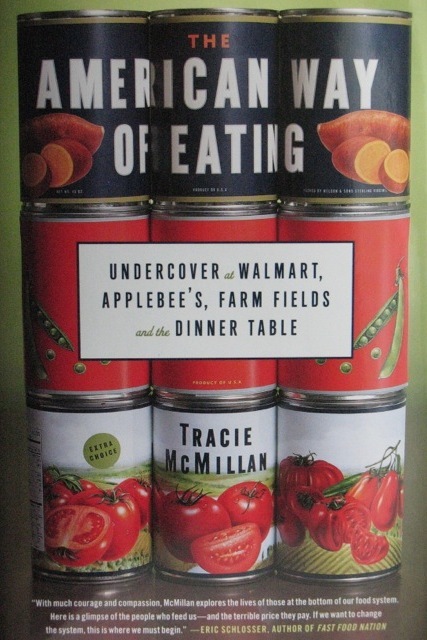 An apt metaphor for Tracie McMillan's The American Way of Eating would be Michael Pollan's Omnivore's Dilemma meets Barbara Ehrenreich's Nickel and Dimed. Just as Pollan examined three systems of food production (industrial, organic and foraged), McMillan explores the three institutions most involved in delivering food to your plate: farming, grocery stores and restaurants. And like Ehrenreich, McMillan puts herself in the shoes of the underpaid and overworked responsible for keeping those institutions running, seeking work as a day laborer in California fields, a produce clerk in Walmart and a line cook at Applebee's. In doing so, she provides both a well-researched and firsthand view into how these institutions and the workers that inhabit them operate. I wouldn't call it a polemic. McMillan doesn't eviscerate the institutions she examines so much as air their dirty laundry. For example, her goal in writing about Walmart isn't necessarily to take down the giant (although after working there she may want to). "I chose Walmart not for its reputation as a union-busting machine, and not even because it's the nation's largest employer. I'm here because Walmart is the largest grocer in both the U.S. and the world." (According to The New York Times, it has 1/3 of the U.S. grocery market share). Using similar reasoning, she chose farm work in California because it's the state that produces the most volume and variety of produce and Applebee's because it's the country's largest casual dining chain. So when the average American goes to buy groceries or goes out to eat, this is what's going on behind the swinging doors. McMillan's first-person perspective is the book's most compelling aspect, particularly her work in the fields, giving a face to the least visible worker in this food chain. She was the only "gringa" among people who showed remarkable camaraderie and generosity despite their squalid living conditions. Her story is sometimes harrowing: Finding work in the fields involves meeting strange men at 4:30 a.m. and while working at Applebee's she endured sexual assault by a coworker (nothing so harrowing at Walmart, thankfully). Then there are the insights into the food itself. In the field, we learn that a lot of what's grown is wasted. Vegetables deemed too small or somehow imperfect are left behind to rot, despite the fact that they are perfectly edible. At Walmart, our suspicions that the produce isn't exactly fresh is confirmed, but we learn further that there's a cutting and crisping station in the back dedicated to rehabilitating wilted produce to make it attractive enough to sell. Ever buy produce only to have it go limp and nasty within a couple days? Now you know why. Applebee's is the most troubling. McMillan describes how, apart from the grilled food cooked on site, most of the food comes precooked or is made from processed ingredients that get reheated or reconstituted in the microwave, sometimes resulting in the plastic packaging melting into the food. Yummy. McMillan's thoroughly researched writing makes her work even more compelling, putting an analytical spin on the political and economic forces driving what she describes. Her view is at once micro- and macro-scopic, giving her case studies greater resonance. There's a lot going on this book and, for the most part, McMillan handles it quite effectively. She loses her way a bit with a brief look at urban agriculture--efforts to grow fresh vegetables within the city of Detroit, which lacks for many decent grocery stores, particularly in poorer areas. While the topic is interesting, it feels like a detour. Is she suggesting this is a possible solution to some of the issue she raises? The economics of urban agriculture would suggest it lacks sufficient output to feed many people, certainly at prices they could afford. That the book aims to highlight an issue of social justice and not just economics, is another of its greatest strengths. In Omnivore's Dilemma, Pollan makes the case that Americans should be willing to pay more for their food, which, no doubt would result in Americans eating better. Although paradoxical to some, for those that have studied the issue, it is well known that fresh produce and meats are more expensive than processed foods like frozen entrees and pasta-and-salt-powder dinners. Diet-related illness is a serious problem, its rise correlated with our love of all things high-fructose corn syrup, to name one offender. European countries that pay more for their food have overall lower obesity and incidence of diet-related illness. Certainly McMillan would agree the economics of the American food supply chain are out of whack. Like Pollan, she discusses how Americans' diet is creating costs other than at the grocery register (such as $75 million per year in obesity-related healthcare costs, with the poor realizing such costs in disproportionate numbers). However, she also looks at the issue with a lens towards fairness, which naturally leads her to raise a class issue. Is it fair to suggest that Americans pay more more their food when many struggle to afford what they buy now? She points out that Europeans' social nets allow them to enjoy other services at a cost lower than Americans, such as child care, and thus their decision to spend more on food makes sense. McMillan is galled by people who spend $6 per pound on farmers market tomatoes and are seemingly unaware that others struggle to afford the mass-market type at the grocery store. Thus her call for better access to affordable and healthy food feels all the more urgent. Her solutions are not simple, underscoring the scope of the problem. She calls for more jobs, higher wages, government-sponsored incentives to eat more fruits and vegetables, and government intervention to better distribute food to reach populations that currently lack access to healthy foods. That these aren't particularly satisfying solutions merely underscores the extent to which feeding ourselves as a nation is an issue worth exploring not just at the individual level but as a national issue too. This sounds like a good book. I know you enjoyed reading it. Her work experiences sound harrowing. Has Applebee's or Walmart commented on what she's written about them?